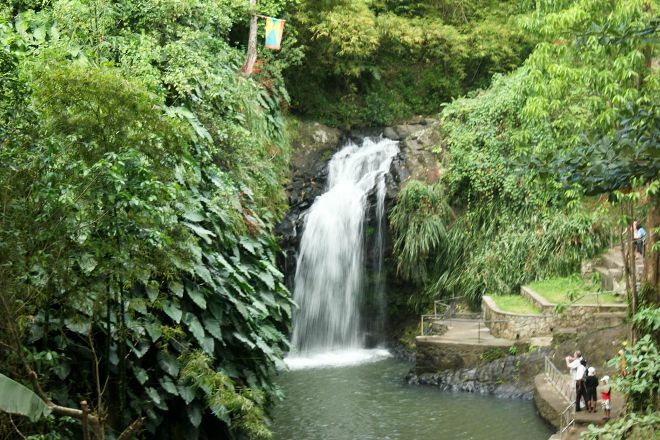 Visit Annandale Falls and immerse yourself in tranquility following a short hike through lush rainforest. The small waterfall, which cascades into a shallow rock pool, is surrounded by rocks covered by patches of green vegetation. A manmade platform on the edge of the pool makes an excellent spot for taking pictures. Along the way, find locals selling souvenirs, vibrantly colored flowers, and fruit growing among the vegetation. Bring some lunch and enjoy the sounds of the forest as you grab a bite. Plan my day in St. George's using traveler tips and tourist information provided by Inspirock. Lovely little waterfall with lookout next to it. Be sure to take the stairs to the top of the waterfall for a lovely view of the basin below. Lovely waterfall. Costs $2 to enter. Good toilet facilities. Waterfall "jumpers" ask for donations to watch them jump. Lovely short walk to the falls which you can access for a very low price of $2us or $5.35EC. Just down the road when you exit the falls there is another smaller waterfall which is people free too so check that out while you're there. The waterfall is beautiful but there is nothing to do there. You can visit this place just to enjoy nature, jump from the rocks into the water or watch other people jump. Every day, we help thousands of travelers plan great vacations. Here are some tips on how to use your Listing Page to attract more travelers to your business - Annandale Falls. Promote your permanent link - https://www.inspirock.com/grenada/st-george-s/annandale-falls-a85639847 - on your website, your blog, and social media. When a traveler builds a plan from this page, the itinerary automatically includes Annandale Falls. This is a great way for travelers looking for a great vacation in your city or country to also experience Annandale Falls. Promoting your link also lets your audience know that you are featured on a rapidly growing travel site. In addition, the more this page is used, the more we will promote Annandale Falls to other Inspirock users. For best results, use the customized Trip Planning Widget for Annandale Falls on your website. It has all the advantages mentioned above, plus users to your site can conveniently access it directly on your site. Visitors to your site will appreciate you offering them help with planning their vacation. Setting this up takes just a few minutes - Click here for instructions.